Pro, Steven (2003) Marine Ich/Cryptocaryon irritans - A Discussion of this Parasite and the Treatment Options Available, Part I [Online] http://reefkeeping.com/issues/2003-08/sp/index.php [Accessed 03/08/2017]. Giwojna, Pete (2007) Hyposalinity or Osmotic Shock Therapy (OST) [Online] http://wetwebmedia.com/ca/volume_4/V4I4/hyposalinity/OST.htm [Accessed 03/09/2017]. Bartelme, Terry D. (2007) Aquarium Fish: Applications for Hyposalinity Therapy: The Benefits of Salinity Manipulation for Marine Fish [Online] http://www.advancedaquarist.com/2007/6/fish [Accessed 03/08/2017]. Pro, Steven (2005) Garlic: What has been Studied Versus What has been Claimed [Online] http://reefkeeping.com/issues/2005-10/sp/index.php [Accessed 03/08/2017]. Pro, Steven (2003) Marine Ich/Cryptocaryon irritans - A Discussion of this Parasite and the Treatment Options Available, Part II [Online] http://reefkeeping.com/issues/2003-10/sp/feature/index.php [Accessed 03/08/2017]. 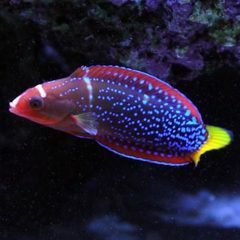 Pro, Steven (2004) An Ounce of Prevention is Worth a Pound of Cure: A Quarantine Tank for Everything [Online] http://www.reefkeeping.com/issues/2004-10/sp/feature/ [Accessed 03/08/2017]. 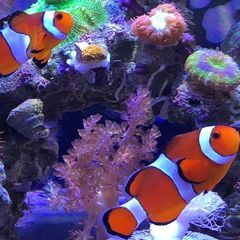 Because copper kills bacteria that process ammonia, bringing an established biofilter into a copper filled tank is not likely to help process ammonia. @Tamberav mentioned great success with a malaria treatment drug, Chloroquine phosphate.